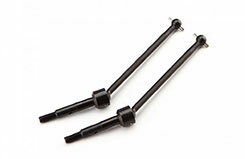 All Products > "106709 HPI Racing Universal Drive Shaft Set (2pc)"
Boost the performance and durability of your Savage XS with a set of Universal Drive Shafts! Universal driveshafts offer more efficient transfer of power to the wheels, for higher speed and smoother suspension movement. These are machined from high strength steel for maximum durability, and are tougher than the stock dogbones and perfect for extreme driving conditions and wild stunts. The unique design is fully rebuildable and eliminates the set screw found on most universal dogbones, making routine maintenance easier. These universal dog-bones are factory designed, factory manufactured and team tested for the best fit.